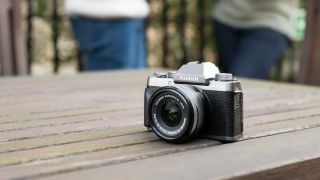 After the specs leaked earlier this week, Fujifilm has officially taken the wraps off its new entry-level mirrorless camera, the X-T100. The X-T100 shares many of the same internal features as the X-A5. These include a 24.2MP APS-C CMOS sensor (with the more standard bayer array, as opposed to the X-Trans design featured in higher-end X Series cameras) with an expanded ISO range from 100-51,200, 4K video capture at 15p, 6fps burst shooting and a 3.0-inch touchscreen. While the X-A5 sports a tilt-angle display, the X-T100 features a new three-way construction, which appears to offer a greater range of movement compared to the design of both the X-T2 and X-H1. This sees the screen able to be tilted away from the body for either waist-level or elevated shooting, while it can also be pulled outwards for those who fancy shooting selfies. The other big change over the X-A5 is the arrival of a built-in electronic viewfinder (EVF), with the 0.39-inch display featuring a 2.36-million dot resolution and a magnification of 0.62x. While many of the internal features are similar to the X-A5, the exterior design is much closer to that the X-T20. The X-T100 has an anodized aluminum top cover, and is available in dark silver, black and champagne gold. While the exterior controls are a little more streamlined compared to the higher-end X Series camera, the X-T100 features three control dials on the top cover. The X-T100 will be available as a kit with the XC15-45mm standard zoom lens in late June, with pricing expected to be £619 in the UK, $699 in the US and AU$1,049 in Australia.